Having installed five robotic palletising systems in recent months at two national distribution centres in the North and South of the UK, Andrews Automation Ltd are now leading the way when it comes to tote bin handling and palletising systems. Our client for this project, a leading media distribution company, is now benefiting from significantly increased productivity and a more streamlined process flow. 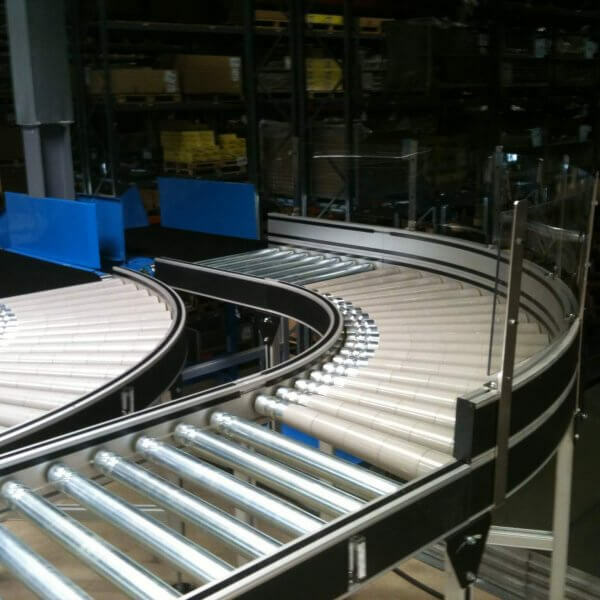 With the capacity to handle over 900 totes per hour, our robotic palletiser system can palletise over 21,000 tote bins every day of the week. Installations were meticulously planned to fit in with client operational requirements. We had a 3 day window, working over the weekend to deliver, build, test and commission each of our robot palletiser systems before operations began again at 6am Monday morning. Engineers were also on-site for two weeks following installation to oversee initial operations, train operational staff, and be on stand-by for any post installation issues. The Andrews Automation tote bin robotic palletising system receives tote bins via a bespoke robot head, controlled by an ABB IRB660 robot. Totes are collected in three’s from one of the two roller powered in-feeds, and then in batches of four’s from the second powered in-feed. This is facilitated by the bespoke design of the gripper head, allowing the pallets to be stacked as per customer specifications. 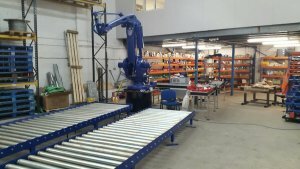 There are many benefits to investing in robot palletisers. Clients have reported significant increases in palletising KPI’s including improvement in throughput and stack stability. They are also reporting constant and reliable ‘pallets-per-hour’ figures throughout the day, every day of the working week. It goes without saying that our robot palletisers do not require breaks, do not fatigue during the course of the day, and will not contribute to any absenteeism or potentially costly RSI injury claims. Clients are now re-training staff previously on palletising duties to carry out other work on-site to assist with reducing other process efficiency issues. For more information regarding how robot palletisers can improve your business, please call our Sales Team on 01405 768900, or email sales@andrewsautomation.box.